The NEW Collaborative Robot Vacuum Tool (CRVT) from Bimba adds unparalleled flexibility to your collaborative robot. The standard CRVT is highly configurable to meet your application needs, but simple to install and operate. This fully integrated tool means all you need to supply is compressed air and a signal to control the valve. A variety of standard and custom options make the Bimba CRVT the perfect tool for your next collaborative robot project. 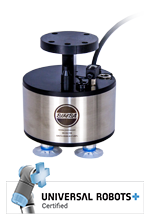 The CRVT is compatible with all current Universal Robots models and is UR+ Certified. See the product in action here.